DXUtil was created to address specific needs of DataExchange users. The current version supports a number of key functions needed in a DataExchange environment that are either not possible or difficult to accomplish with existing tools (like BUTIL). The first function of DXUTIL is the CLONE functionality. 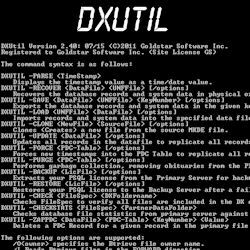 Similar to BUTIL -CLONE, the DXUtil tool improves on BUTIL by adding the ability to create a file on top of itself, effectively blanking the file's records. This can be helpful when blanking a PDC table or a file on the target server if you need to reset a file's replication status. Additionally, DXUtil gives you the ability to create the cloned file in any file version (currently 5.x through 9.5) supported by your engine. We've been wanting this feature from BUTIL for years! DXUtil also supports the functions RECOVER, SAVE, and LOAD. While similar to those of BUTIL, the DXUtil versions also export (and subsequently reload) the system data values from the data file, which can eliminate the need to re-replicate a large chunk of data after a file corruption event. The /I and /J flags from BUTIL are also supported here for improved recovery of damaged files. Ever need to force re-replication of a single file? Need to replicate changes made to a file off-line by the application vendor? Instead of blanking the PDC, you can use the UPDATE function, which tells DXUtil to update every record in the specified database file, causing all records to be touched and subsequently marked for replication. The FORCE function tells DXUtil to forcibly update a specified PDC table with new LastModified timestamps. While being less "safe" than the UPDATE option (since it cannot run while replication is running), it is actually faster than the UPDATE since it hits JUST the PDC table. Another option, PURGE, can be useful for clearing out obituaries from PDC tables. Finally, the CHECK and CHECKSTATS options are replication validation processes. The CHECK option looks at a list of files (with wildcards) and verifies that each table is in the replication database. This can be useful to locate newly-created files in your application that are not being replicated properly. The CHECKSTATS option goes one step further and compares the statistics of the production and secondary databases for mismatches like file version, record size, record counts, and key definitions, allowing you to identify replication problems before they result in a massive loss of data. For more information about this tool, click here. This is the Single-User license. This license allows you to use this tool on any computer on your local area network. ©2011-2019 Goldstar Software Inc. All Rights Reserved.